The pupils of Cubay Elementary School in the Division of La Carlota City had proven themselves how they were ever ready when a natural disaster will come anytime like the earthquake. Their alertness and readiness were tested recently when an earthquake drill was conducted in by the school principal, this blogger. It was 10:15 in the morning when the grade four class of Mrs. Melanie Reyes was first evaluated. Since this was the class that was going to check on how prepared are they, I never used the bell to signal the occurrence of the earthquake. Instead I tapped the table for a minute, meaning there's an earthquake and the building is shaking. As I tapped the table, they alerted themselves, "duck, cover and hold" as they hid under their armchairs. When I stopped, they went out slowly from the room, still in "duck, cover and hold" manner. They headed to the open place as designated as the evacuation center. As they settled there orderly, their teacher conducted a head count by checking everyone's presence. The grades one, two and three were also evaluated separately. They did it perfectly as per instructions given to them. The grade five and six were evaluated too. As they went back to their respective classrooms, they discussed the results of the drill, especially those things that needed to be improved for the next earthquake drill. Phase 1. Alarm. A 1-minute alarm when sounded means earthquake or shaking. Phase 2. Response. While the alarm is ongoing, everyone should perform "duck, cover and hold." Remain in this position until the "shaking" stops. Phase 3. Evacuation. When the shaking stops, immediately evacuate the school building and proceed to identified evacuation areas by following the routes led by the class marshall or teacher. Phase 4. Assembly. Where they are in the evacuation area, the students must be grouped together according to the class where they belong. Phase 5. Head Count. Teachers should check and make sure all students are accounted for. Phase 6. Evaluation. The over-all coordinator will announce the termination off drill or "All clear". An evaluation of the drill must be conducted to identify problems encountered during the drill and how these can be improved in the future earthquake drills. Our pupils were traumatized by the earthquake of February 6, 2012 with 6.8 intensity that shook the Eastern part of Negros Occidental island including our place, La Carlota City, PH. They remembered how the coconut trees were shaking rapidly during the quake before noon of that day. Some recalled how their classmates quivered, getting nervous, cried very loudly, and calling for their parents. 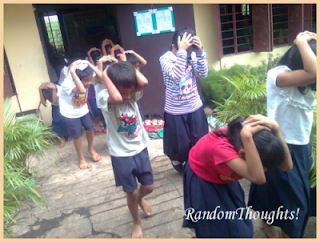 This recent earthquake drill conducted by our school is in compliance with Department of Education (DepED) Order No. 48, s. 2012, "Quarterly Conduct of the National School-Based Earthquake and Fire Drills." It stated, "The activity aims to generate the highest level of awareness among the public on Disaster Risk Reduction/Climate Change Adaptations (DRR/CCA) concerns and to assess the capacity level of the school and the community in the eventuality of disasters and emergencies." Report of this earthquake drill of our school was submitted to the division DRRM for consolidations. Submission of reports including the Drill Evaluation Form are required for strict compliance in order to evaluate the level of awareness an preparedness of all schools during disasters and emergencies. 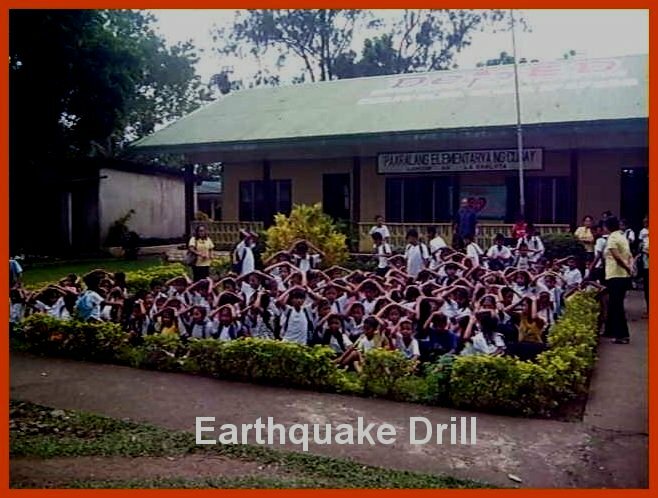 Being an earthquake survivor, an earthquake drill is a must for younger students as they need to have presence of mind when it comes to situations like this. this is very important in every establishments not only in schools. earthquakes unexpectedly happen. everyone must be educated how to suvive. 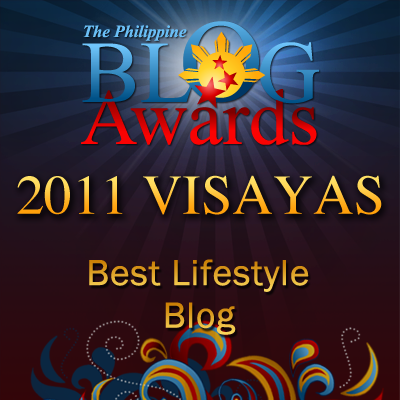 thanks sir gil for sharing. I agree sir. Having Earthquake drill activities is a must not only in school but all establishments. Especially now that earthquake happens unexpectedly with no warning. It's better that even little kids are prepared to whatever event will happen. Kahit sa bahay we must teach our kids, helpers and other what to do in case of earthquake. Earthquake drills are extremely important. It's good to know that schools these days have these drills regularly to protect the kids, teachers and school staff. Hoping no earthquake will happen though. I know how important it is to have earthquake drills to make everyone aware. I just don't remember if we ever had one when I was in HS.